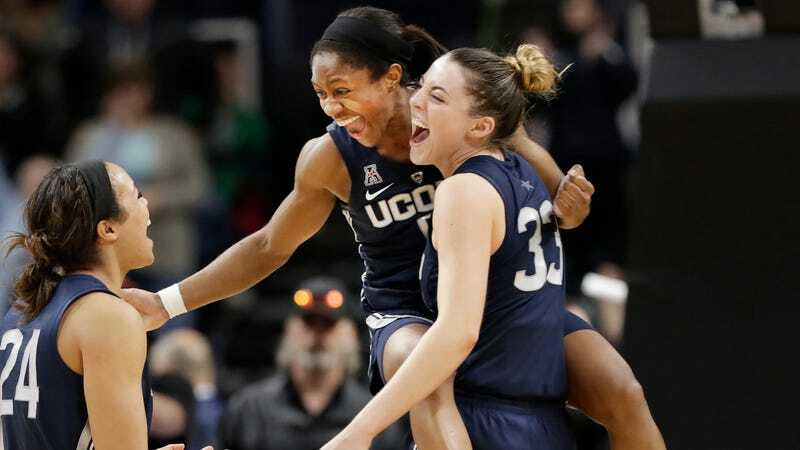 For the first time since before their historic streak of Final Four appearances began, the Connecticut Huskies weren’t favored by the NCAA Selection Committee to win their region and advance. UConn was a surprising two seed, not a one this year, but in their Elite Eight battle today against top-seeded Louisville, the Huskies proved that the committee made a mistake, winning 80-73 to avenge their loss to the Cardinals earlier this season. UConn kept Louisville at arm’s length for most of the game, maintaining a lead of a couple possessions or so throughout the second half, and hitting their free throws down the stretch to ensure it stayed that way. Cardinals star Asia Durr led her team with 21 points, but she struggled mightily to initially get it going, shooting just 1-for-10 from the field in the first half. Louisville was down seven at the break, and once Durr did heat up a bit, UConn guard Katie Lou Samuelson made sure it didn’t matter. Samuelson scored 29 points, and absolutely owned her territory beyond the arc by hitting 7 of UConn’s 14 total threes. With their ticket to the Final Four punched for the 12th straight year, UConn now faces an even juicier chance for revenge than just beating a foe who took them down in the regular season. If Notre Dame can beat Stanford on Monday, we’re set for a sequel to last year’s instant classic semifinal.